When Dan O’Bannon wrote the script for Alien, he created a series of complex characters whom he intentionally made free of gender. Although many men were seen for the role of Ripley, Casting Director Mary Selway brought them a woman who had every quality they were looking for. When Sigourney Weaver filled the role of Ripley, the only script revisions were to change pronouns from “he” to “she”. Otherwise, who Ripley was and what Ripley did was immaterial to their gender. That’s the story that came to mind when I realized that I had written a character whose gender was irrelevant, and I had “defaulted” to them being male. In Time Wars Tales: the Beginning of a Bizarre Friendship, the protagonist is known only as Agent Mu, and I discovered that the story was unchanged – perhaps, in places, improved – by changing all gendered references from male to female. You’ve met this character before. She has black hair with a colorful stripe, wears green or purple lipstick with chipped painted nails to match; she wears black leather clothing that’s cut a little short in place, designed to help her while she skateboards or rides a motorcycle; she has a series of skills which are “for boys” and has interests which are “for boys”. In the first act we meet her and she seems rude and dismissive, saying “whatever” and rolling her eyes. In the second act we are shown that she secretly has a feminine and caring side – almost universally in the process of learning that she secretly cares for the male protagonist, and is too insecure to admit it. In the third act she learns to reconcile her feelings for the protagonist with her tough-as-nails identity and uses some typically “for boys” skill – usually combat, but also often hacking or deductive science – to save the male protagonist… so that he can save the day. You’ve seen her in The Matrix, NCIS, and Big Hero 6. Some people have called this class of character “Trinity”, because of the character from The Matrix: a character who is female and appears strong, but has no real substantive effect on the plot. I’m talking about something slightly different, although there are many overlaps. There are Trinities who are not Strong Female Characters (SFCs). The best example might be Pepper Potts from the Iron Man films, who seems capable and clever, but never defies her expected femininity, and also contributes nothing to the plot that couldn’t have been contributed through some other means. And there are SFCs who are not Trinities. An example of that would be Abby Sciuto from NCIS. She does, in fact, contribute to the plot, and does so by being the only person who has the skills and knowledge to deduce the truth. But Abby is also the Jar Jar Binks of the series. She is there so that we can laugh at how out of place she is. Even when other women join the cast, often with characters who are from different nations or divisions of government, they seem more like the other characters than Abby. Unlike her calm, cool, snappy, and acerbic colleagues, Abby is bubbly, insecure, gregarious, and affable. In other words, she would make a perfect geisha. If it weren’t for her incorrigible love of science, that is! That’s the definition of a SFC. A character whose exterior qualities and achievements are designed to stand in contrast to her inner feminine vulnerability. She is given value because of her masculine traits; she is kept from being the protagonist because of her feminine traits. A character who is strong is not necessarily one that is well written. A character that is female does not have to be defined by being female. A character that is designed to evoke a trope or fill a perceived voice is barely a character, and more like a caricature. So what do the good characters look like? Well, I think you’ll be surprised to hear this, but Trini Kwan and Kimberly Ann Hart from the Mighty Morphin Power Rangers are wonderful. Kimberly and Trini regularly talk to each other, and in the absence of the male characters. They discuss hopes and fears, their personal ambitions to become professional gymnasts, and the ways in which they can succeed in their war on evil. 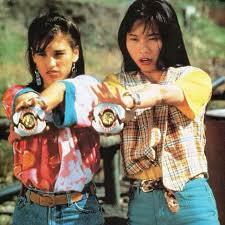 In other words, Mighty Morphin Power Rangers passes the Bechdel Test on the regular. Trini likes to cook, and what she cooks is typically very evocative of the fact that she is an immigrant. Her friends are often grossed out by the food that she loves. While it’s played for laughs, anyone whose palette is remarkably different than most Americans will understand that this is a real part of the immigrant experience. Kimbley likes to wear makeup, go shopping, and have emotional conversations with her peers. When male characters like Billy and Zack get frustrated with their own shortcomings or limitations, it’s usually Kimberly who intervenes and engages them emotionally. She is a nurturer, and would probably make a great mother. But both are also soldiers in a war against unspeakable evil, whose physical and mental discipline is unmatched anywhere on Earth. They command machines of war the size of buildings. When Trini’s friends are frozen with an alien beam, she has to travel to an alien world and recover the cure herself. She summons the strength of the Sabretooth Tiger, accomplishes her goal, and returns to defeat the monster almost single-handedly to save her friends. Later, a monstrous toad-like being begins devouring the Power Rangers, slowly digesting them and absorbing their powers. Kimberly is the only Power Ranger to avoid being eaten, because of her gymnastic skills. She uses physical prowess and clever tactics to put the toad in a vulnerable position, and fires a single shot from her energy bow. That shot screams through the air and splits the monster in two, freeing her friends. These are not stories with tremendous emotional depth, nor are they terribly nuanced and subtle. But they do demonstrate a level of feminism still absent from the Marvel Cinematic Universe, and which will surely be absent from the upcoming DC Cinematic Universe. The female characters are in no way defined by their relationship to the men around them. Their accomplishments are their own. What they bring to their team has nothing to do with their gender. They do not attempt to emulate typically masculine behavior, and their feminine qualities are never hidden and never a source of weakness. Of particular note would be Trini’s relationship with Billy – by which I do not mean a romantic relationship. Fascinatingly, Trini and Billy remain one of the most clear-cut male/female friendships ever depicted on television. Billy tends to speak in very long words and sentences to say simple things, using “egg-headed” terms for comedic effect. It was originally just convenient to have a “translator” who took Billy’s long lines and put them into conversational English. This role fell to Trini. This makes a great deal of sense to me. As an immigrant, Trini would be the only other person with an esoteric knowledge of English, and would be more likely to have learned academic words while studying her English textbook. The relationship evolved from there, with Billy turning to Trini for advice, and Trini regularly standing up for Billy against bullies. In an early episode, Trini puts herself between Billy and the aliens attacking him. The moment where she puts up her fists to save her male friend had me, both as a child and as an adult, enthralled and excited. When Dan O’Bannon and Mary Selway created Ellen Ripley, and when I re-wrote Agent Mu to be a woman, it worked well because the characters were already dripping with complexity, and that complexity was not tied into their gender. No character is capable of achieving that level of complexity while written under the assumption that a female character becomes more interesting by giving them typically masculine traits. When characters like the Power Rangers are written without this assumption, then they may not start out as being terribly complex, but they at least provide themselves the option of becoming more complex as they develop. Bijhan Valibeigi is the creator of Time Wars Universe, the free role playing game of time travelling espionage Strike Team, and the world’s first deck-stacking gameSupreme Command; she has also written the Time Wars Tales series, which includes the book Beginning of a Bizarre Friendship and the action adventure fiction blog Legends of the Order. When Bijhan is not pwning newbs in every kind of game ever made, hating on TNG for being objectively worse than Star Trek, or cheering for the BC Lions, she spends time at home with her partner RaeRae, three lovely cats Reza, Kya, and Jasper, and old cranky dog Elsa.